Detroit Youth Volume students ages 3-18 learned to produce their own electronic music in 2018! The Winter/Spring workshop series ran parallel to regular Suzuki private lessons and group classes in the Detroit Symphony Orchestra education wing. Teaching artists include Scott Murphy, Sterling Toles, Molly Jones, Moxie Strings and Raphael Statin (bios below). We love when local musicians mentor our students! All of our electronic music-making guests aside from Moxie Strings have worked with our kids before. This project has given them a chance to have a more meaningful impact on our youth by deepening their relationships. Collaborations with local artists as guest instructors during special projects develop positive cultural identities in our students as Detroiters and as youth of color (applicable to 70% of our kids). ​Scott Murphy was once written up in the Gothamist as the best street performer in New York City where he was working as a performer and sound engineer. Scott studied intensively for three years with Grammy-winning violinist Eric Levine. Now, in Detroit, he works as a sound engineer for Tangent Gallery by night and as a violin teacher with Detroit Youth Volume by day. In his third year with DYV, Scott will be this project’s lead, including hand-picking the following guest instructors. 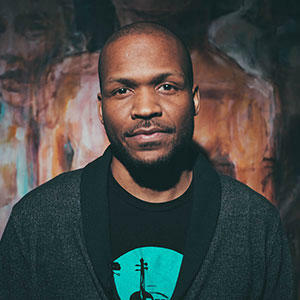 Sterling Toles is a Kresge fellow, music producer, and teaching artist. Sterling has worked with DYV before on a hip hop violin album in 2016. This east-side-bred, Cass-Corridor-educated Detroiter views himself as a healer using sound. Check out his Resurget Cineribus album. It's a 67-minute piece that tells the story of “Detroit 1967” with infinite sound samples and interviews with his father Dennis Edward Toles. Molly Jones improvises on saxophones and flute, and composes for improvising ensembles. Molly just completed a thesis statement with Joo Won Park, Wayne State University electronic music professor. During grad school at University of California’s music dept, Molly worked to incorporate technology meaningfully into her compositions and improvisations. Molly helped produce the workshop series and year-end show during Jazz Violin “The Detroit Way”. Rafael Statin a remarkable saxophone improvisational soloist and composer of electronic music production who once played in the Detroit Symphony Jazz Orchestra as a child in the same building the DYV students rehearse today. Rafael improvised on sax with DYV during our performance at the Charles Wright museum on Dilla Youth Day 2017 to celebrate J Dilla, "the Mozart of hip hop". 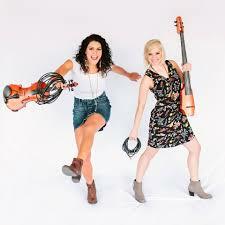 Moxie Strings is “top-notch, instrumental wizardry,” composing the majority of their pieces and arranging melodies from many traditions, resulting in a genre-blurring blend of ear-catching melodies and foot-stomping, rock-influenced rhythms. Alison performs on a newly-invented, electric cello, and Diana on a contemporary 5-string violin, both through a variety of audio effects pedals. Their polished, high-energy show and unique sound are redefining strings' role in contemporary music. We like our students to be able to work with the most cutting-edge music technologies available today. With the tools below, our student made tracks of their own. They created bass lines, chords, hooks and then played violin over it! Electric violins - NS Wave - Thank you, Mimi Ferrara for gifting us this key tool! Future Dreams / Wish List - In addition to electric violins, a basic synth and drum machine, we’d like to create a library of pedals and effects that can be checked out for homework assignments. For our pint-sized producers, we’d like to equip an old PC with recording software. Mr Scott is even going to let us use his super fancy modular synth! Basic synth - "You can run an electric violin through it and learn to build your own accompaniment. We want our students to physically interact with a synthesizer rather than a software app because that is what they would be using as future musicians of the world. Just as we wouldn’t want to give our students a violin app, we want them to have the real thing. This is a new instrument they would learn to use." Modular synth - "It does everything from bass drums to flute sounds to squelching electronic madness. You can use the signal for your violin to create electrical impulses which them influence events in time. It’s like a puzzle that you play with your violin. It is the musical science of chain reactions. "